Chairman Kang, Young-joong of Daekyo Group is elected as the 10th President of Korea Council of Sport for All. The Korea Council of Sport for All had a provisional general assembly on March 9th, 2015 in Seoul Olympic Parktel, and Chairman Kang was elected as a new head of the Council. Former President Seo, Sang-gi had stepped down at the end of last month from the Council because of a law that prohibits National Assemblyman to take up another post. Therefore, the new President will lead the organization for the rest of the former president’s term until early next year. Chairman Kang, who had been the President of Badminton World Federation (BWF) from 2005 to 2013, said, “I will work hard to help every Korean people enjoy sport for all and become healthier”. Chairman Kang had announced his attention to run for the Presidency on Feb. 24th, promising he will strive to “realize a sports welfare that can make people healthier and happier and open up an era of average life span of 100 years”. 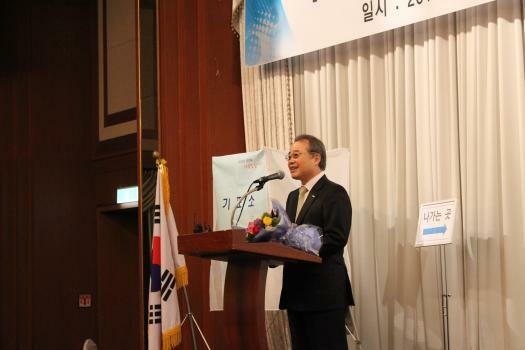 In the election, Chairman Kang won 82 out of 139 votes, while his competitor Professor Jeon, Byeong-gwan won 57 votes. As a revised Sports Promotion Act was passed by the National Assembly on the 3rd this month, Korea Council of Sport for All is slated to be integrated with Korea Olympic Council by March 2016. The new President of the Council Kang, Young-joong has to take up the responsibilities of integrating the Korea Council of Sport for All and the KOC for about a year. Dr. Kang had been the President of Badminton World Federation (BWF) from 2005 to 2013 and the President of Asia Badminton Confederation from 2003 to 2005. He also has been appointed to Honorary Lifetime Vice President of BWF since 2014. I think it is good thing that Dr. Kang won the election. He worked as President of BWF so I believe he knows about sports world very well. I wish for successful integration with KOC in good condition. Also, I hope Dr. Kang recognizes that sports for all sports associations are the basis of KCSA and provides good working conditions to the staff. The new president is a man who carries on a large business and has been contributing for the development of Badminton in elite sports for a long time. As he also has know-how on running big company, I believe he will handle integration problem well. But I hope Dr. Kang will show strong expression of will when integrate two organizations so our organization can stand on an equal footing with KOC. The budget for KCSC is much less than KOC. However sports for all have cost cutting effect on medical expenses and National Health Service. I believe Dr. Kang is right person for the integration. The budget for KCSA is over 100 billion won. He is a business man who is the head of big company and I think he will handle our organization well. I was impressed with Dr. Kang’s word that he will try to make the organization can operate by itself. The biggest problem in different types of sports for all sports association is guarantee social position. Under the rule, the presidents of sports for all sports association have right for recruitment. Therefore, staffs are often changed when the president of the association changes. In order to secure stable development, I strongly believe guarantee staffs’ social position is necessary.